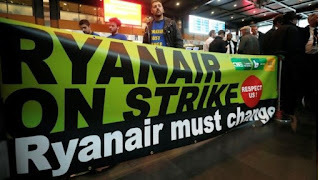 Tens of thousands of Ryanair passengers across Europe are suffering disruption as strikes cancel 250 flights. 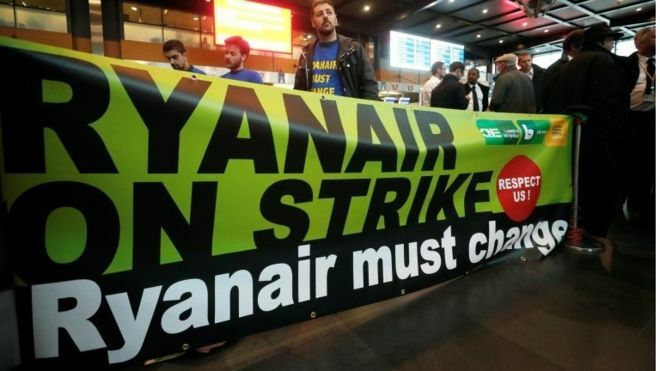 Unions claim this is the biggest day of action yet against a series of complaints about conditions by Ryanair workers in a raft of countries. Ryanair say 35,000 passengers have been affected. But it added 90% of flights would operate as normal. Some 20 flights to and from Ryanair's biggest European hub, Stansted, have been cancelled. The travel editor of the Independent, Simon Calder, said these were mostly to and from Germany. He also said eight Manchester services - to and from Barcelona, Berlin, Faro and Malaga - have been grounded, as well as flights from Birmingham to Lanzarote and East Midlands to Malaga.